While others decorate their Christmas tree we installed the 30m measurement tower at the forest field site in Mieming. Ideal preparations by our technicians, heavy machinery, lots of manpower and a “flying construction worker” made things running smoothly and swiftly. where currently the new forest field site is established with heavy machinery in use. The foundations were built, components of the 30m tower just arrived and will be mounted next week. 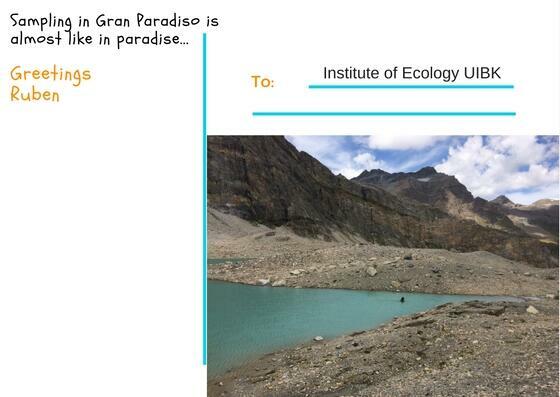 The site will be used jointly by the institutes of Ecology, Atmospheric and Cryospheric Sciences, Botany and Geography. 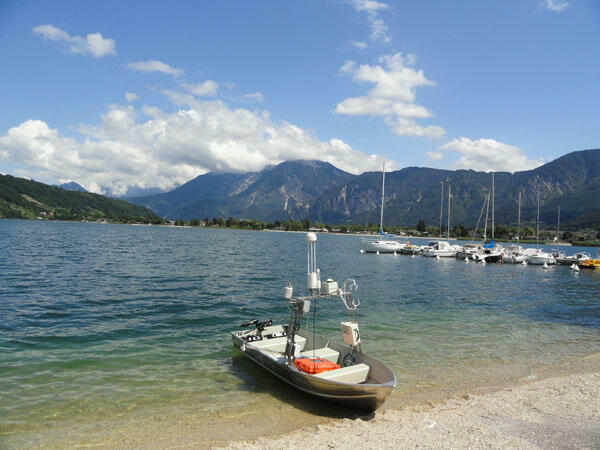 with weather conditions being less than optimal we moved our flux measuring equipment from Lunz am See, where we were measuring for the past four years, to Mondsee. The flux tower will be in operation at the shore of the Limnology Institute at Mondsee within the frame of the ALCH4 project for the next year. We are currently running the calibration campaigns of our LTER microclimate stations. We align sensors that are in long-term continuous use with newly calibrated sensors. Sampling melanic Daphnia ‘zschokkei’ for a study on speciation and hybridisation in water fleas. The Biometeorology group set sail again. With our new group member "Shirley" (named after Thomas Shirley who first experimented with methane) we are visiting different lakes in South and North Tyrol to measure lake-atmosphere methane fluxes. 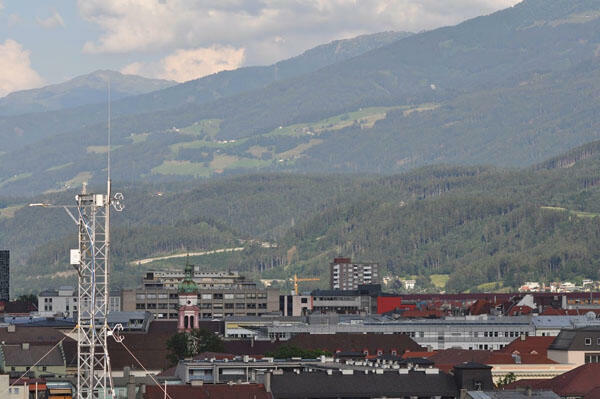 Greetings from downtown Innsbruck, Bruno-Sander-Haus where I join an intensive observation campaign at the “Innsbruck atmospheric observatory”. 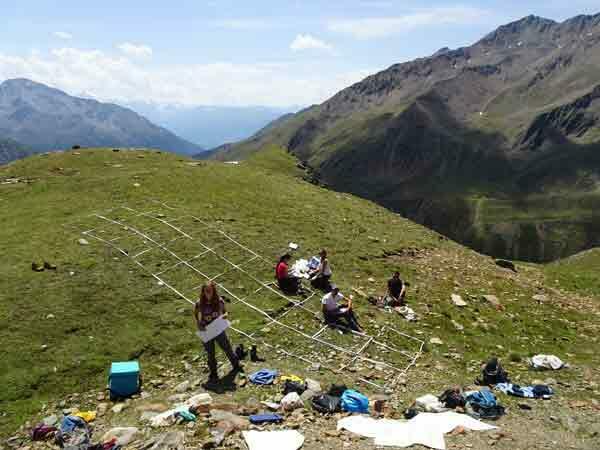 Greetings from our protectAlps study areas on “Hoher Sonnblick” in the national park “Hohe Tauern” and from “Zugspitze”, with the highest insect trap in Germany. Greetings from the Völser Teich, where we are sampling toads and water to monitor the presence of Bd (Batrachochytrium dendrobatidis), a chytrid fungus threatening amphibian populations worldwide. 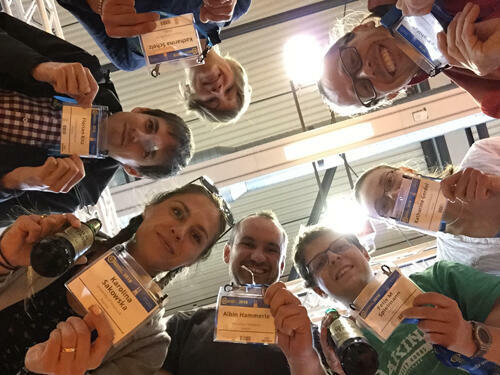 Every year around 14.000 scientist from all over the world gather at European Geophysical Union General Assembly (https://www.egu2018.eu) in Vienna to present and discuss their latest research in Geosciences. After one week packed with oral presentations, poster and PICO sessions we return back home exhausted, but full of new ideas and experiences. Georg, Katharina G., Felix, Albin, Karolina, Florian, Katharina S.
zum Weiterlesen: ein Artikel im 20er (März 2018) zur Arbeit im Projekt "Ökosystemleistungen erleben"
Digging for mysteries in and under the ice cover. Winter #limnology in Gossenköllesee with our Master students. since the 23th of January, I am aboard the RV Poseidon, going by ship off the coast of Mauritania. Ten scientists from the GEOMAR - Helmholtz Centre for Ocean Research Kiel and the University of Innsbruck analyze the water and atmosphere. With the ship we follow an upwelling patch, which brings cold water from the ocean depths to the surface in this part of the Atlantic which belongs to the most productive ocean regions worldwide! We examine different gases, chlorophyll, temperature, salinity, microorganisms and squid. denn wir mussten den Niederschlagstrichter richten. Greetings from Kühtai and Penser Joch! Gemeinsam mit unseren wissenschaftlichen Gästen Dr. Sandra Lavorel und Dr. Karl Grigulis (LECA Grenoble) sind wir im LTSER Gebiet Matschertal unterwegs. 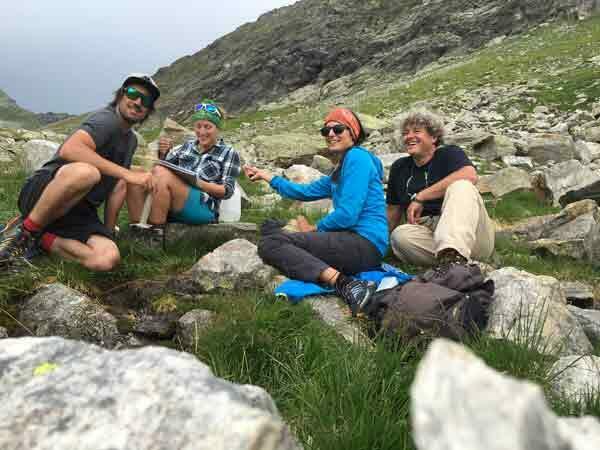 Unter Führung von Georg Niedrist (Eurac.research, Institut für Alpine Umwelt) haben wir die auf 2700m gelegene Klimastation besucht und die Kulinarik auf der Oberetteshütte analysiert. Während Sandra und Karl dabei „plant traits“ genauer unter die Lupe genommen haben, konnten wir uns vor Ort ein Bild von den Kraftwerksprojekten am Saldurbach und am Upibach für unser Agent Based Model zur Wassernutzung im Matschertal machen. weder von Sense, Rechen, noch von Gabel. drum hat die Mahd auch nun ein Ende. und schicken von der Kaserstattalm – schöne Grüße. bin derzeit in Berlin bei einer Messkampagne gemeinsam mit Fred Meier von der TU Berlin. Dabei geht’s um Messungen der Mikrometeorologie in der Stadt Berlin um Validierungsdaten für ein Stadtklima- und Schadstoffmodell zu erhalten. Mit von der Partie – unsere Thermokamera und der Ökobot. 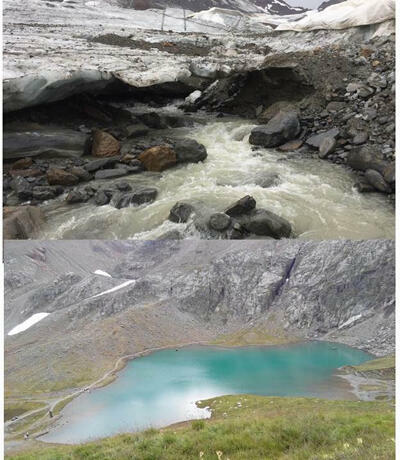 Assessing the heterogeneity in chemical properties and biological responses of glacial meltwaters in different catchments. Here the Weißsee in Kaunertal. 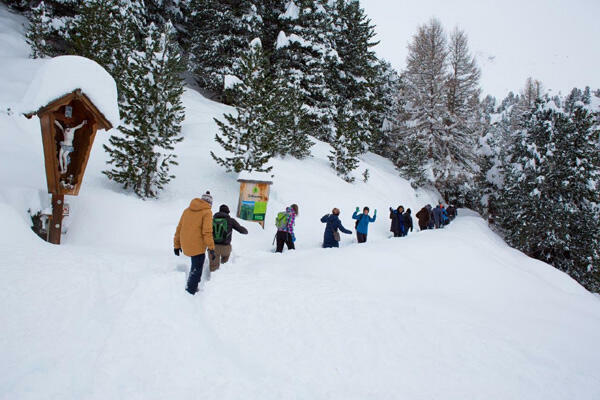 just launched the snowbed-project in the sampling area Matsch, South Tyrol, which will continue at the Furka in Switzerland and finally in the National Parc Hohe Tauern. Greetings from the Central Alps! Sampling micro-catchments in Easttyrol, Carinthia and Salzburg. After long hikes, ready to measure nutrients and water chemistry for longterm ecological research - implementing the just launched project! 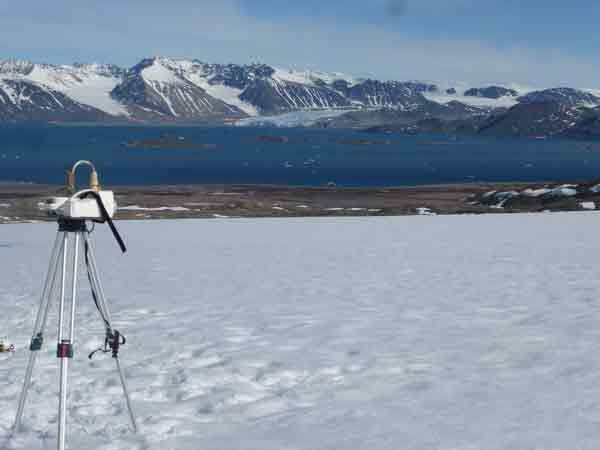 We spent the last weeks carrying air samplers on glaciers around NyAlesund (Svalbard, 79°N). 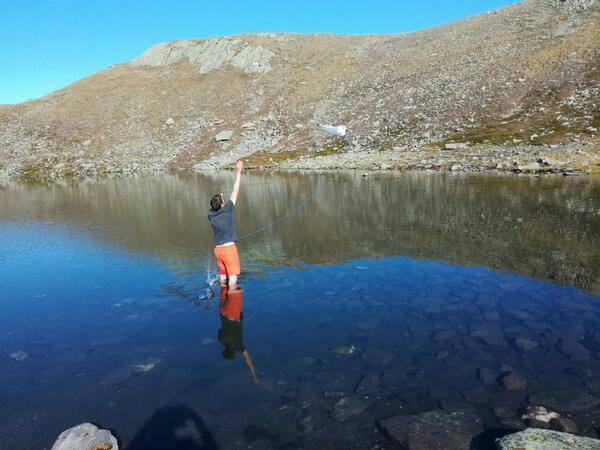 Once the deep melting slush was gone, we had amazing days and took a big bag full of samples to assess aerial microbial biodiversity and abundance. What a great place to work ! 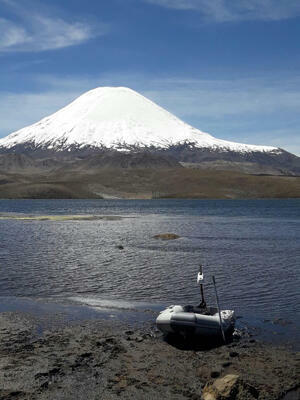 Hard work is the motto of sampling in this type of lake with very strong winds, low oxygen to breath and cold temperatures. we are on an excursion with 15 ecologists studying hydrology, chemistry and biology of glacial streams in the inner Oetz Valley. 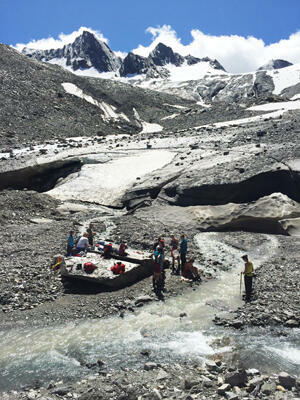 We have been searching for the glacier mouth, and found it eventually, but not on the spot it was last year. We are currently preparing our pulse-labeling experiment on the ClimGrass field site in Raumberg-Gumpenstein. Additionaly we perform various measurements to display carbon dynamics on species-, canopy- and ecosystem levels. 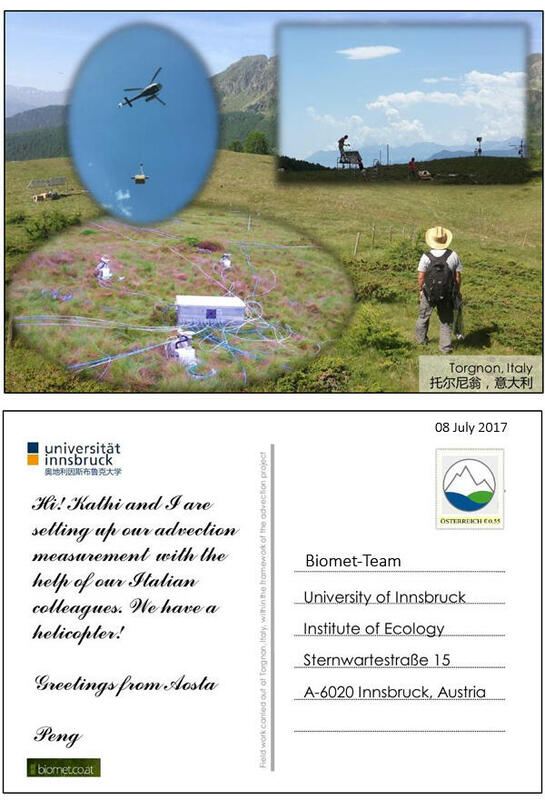 On the "postcard" attached, you can see our Master students Lena and Lisa performing measurements of light-dependencies of photosynthetic rates on species level. On a ClimGrass-field plot, using a LiCor LI6400 device.